I replaced an SD show with an HD source yesterday and removed the old show from Kodi and scanned again to re-import it with the new HD info, but it wouldn't import. I stayed up way too late googling around trying to figure out what was going on, but I've not been able to find a solution. Further poking revealed that the show was being imported, but none of the episodes. I am currently using Kodi v18 x64. Ths first show legit doesn't have proper nfo data, but the majority of them (like Azumanga Daioh) do. 10:01:24.051 T:17160 ERROR: VideoInfoScanner: Asked to lookup episode https://kodi.darkholme.net/kids/Series/A...pecial.mkv online, but we have no episode guide. Check your tvshow.nfo and make sure the <episodeguide> tag is in place. episodeguide's presence is variable on a per-show basis, but the shows still won't scan in, giving this same message, regardless of whether it is present. Some googling showed that the URLs present in the field are the old v1 tvdb format, which I've found some claim to be problematic now. I have nfo files for all of the episodes, so based on my understanding of Kodi's data handling it shouldn't be trying to do an online lookup of this data anyway. I tried removing the episodeguide tag on a few shows that had it, but it didn't make any difference. A few weeks ago I was still on Kodi 17.3 and these exact same files were importing just fine at that point. Not sure what I should do here, any suggestions? 2. Do you have episode nfo files? If yes, post one of them also. Hey, I normally do have the advancedsettings.xml to filter out the Extras folder, it's not present because this was a clean profile for debugging pruposes. To be clear ALL of the shows are having this issue. The ones without nfo files are expected, since I'm still setting them up, but I have dozens of shows (not all are in this log) set up with nfo files that worked fine a few weeks ago but none of which are imported by Kodi now. There is nothing wrong with the nfo files. I tested and they both scanned ok.
As you have episode nfo files, then the <episodeguide> URL is not needed. The only reason it would be asking for one is if the scanner cannot find your episode nfo files, and that looks to be the case as there is no mention of them in the log. Do you have local artwork for the show? (2019-02-10, 03:02)Karellen Wrote: There is nothing wrong with the nfo files. I tested and they both scanned ok.
All the files appear to be named properly. There is local artwork, thumbnails posters and all, as shown in the screenshots. Yep, absolutely nothing wrong there in the folder. Now I am struggling. The only other thing that comes to mind is the file itself. I know the contents of the file are ok, as it worked on my system, but I am wondering if the file itself is in the wrong format at your end. I couldn't tell as I copied your paste into one of my own nfo files, so it was bound to be ok. Which media manager did you use to create the files? 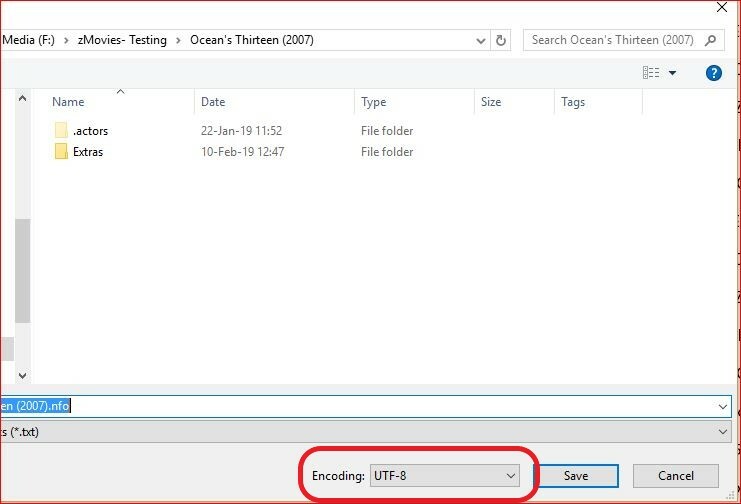 But if I use the file command on the file server, it identifies it as utf-8. Seems a little strange. I'm poking around more and I realized that I didn't say that kodi accesses the files over https, not locally or over smb. I made sure the nfo files are being served as text/plain; charset=utf-8, the Japanese characters all look right when accessing them via the http server. Yep, I saw that and wondered if that was also an issue, but maybe I have wrongly assumed all your other TV Shows are accessed the same way and they don't have a problem? But if that was the case, the tvshow.nfo would not be discovered either. (2019-02-10, 07:13)Karellen Wrote: Yep, I saw that and wondered if that was also an issue, but maybe I have wrongly assumed all your other TV Shows are accessed the same way and they don't have a problem? In my setup Kodi accesses all files over https. Nothing is served by another protocol. All TV shows are affected by this issue. None will import at all. Movies are importing fine. To throw another wrench in the works, I tried importing the files over smb instead and that worked successfully. So, it appears my issue is only occurring when importing over https. I went ahead and reverted to Kodi 17.6 and everything is behaving as expected. I think I'm going to need to file a bug report for this. Ah, if only you had mentioned it was ALL your tv shows. You made it sound like it was this one show. Yes, file a bug report thanks. (2019-02-10, 08:06)Karellen Wrote: Ah, if only you had mentioned it was ALL your tv shows. You made it sound like it was this one show. I did mention that, twice. In the first post I said that no shows are importing, and in my second post I said that this issue was affecting all shows. It hardly matters though, thanks a lot for your help. I've created the bug report on the issue tracker, we'll see where it goes from here. (2019-02-09, 23:32)sanmadjack Wrote: and found that no shows are importing. Yes you did. Reading a hundred posts a day, and replying to a portion of them, you tend to forget the "little" things when you come back to respond.